If you want to travel into the Solar System, you have to get off the Earth. Traditionally, that meant blasting off in a rocket. But there’s another strategy for escaping the Earth’s gravity. Climb to the top of an extremely tall tower, and just jump away. That’s the idea behind space elevators. Theoretically possible, but practically unfeasible, space elevators have gotten new life thanks to new, super strong materials. Fraser Cain: Hi Pamela. Space elevators – we had a bunch of people ask us to do a show on this. And we live only to serve. If you want to travel into the solar system, you have to get off the Earth. Traditionally, that meant blasting off in a rocket. But there is another strategy for escaping the Earth’s gravity. Just climb to the top of an extremely tall tower and just jump away. That is the idea behind space elevators. Theoretically possible, but practically infeasible, space elevators have gotten new life thanks to new super strong materials. Alright, so then, why don’t you explain the problem first that I guess the space elevator is trying to overcome. Pamela:	It’s energy intensive and that energy just kind of goes away. So, you fire chemical engine and once you’re in orbit all those chemicals have gone away. You’ve spent lots of money and you’ve destroyed what you flew into space with. It’s kind of sad. Fraser: Right, you have to get from zero to tens of thousands of kilometers an hour going around the Earth. It costs at least $1,000 a kilogram, more like $10,000 a kilogram to launch stuff into space. Pamela:	So you have severe weight restrictions and it’s just dangerous. Who really wants to attach themselves to end of giant, uncontrollable fire? He was very aware that he was attached to an explosion and he didn’t like it one bit. So then the solution here is the space elevator. Who came up with this? Pamela: It’s one of these things where Americans may not realize this, but the idea actually came out in Russia a long, long time ago. Russian scientist Konstantin (and I’m going to mispronounce this and I speak Russian, but it’s written in Latin letters while I’m looking at it) Konstantin Tsiolkovsky came up with the idea that we should build a giant tower where the end of the tower is in geostationary orbit. His idea was let’s start at the ground and build our way up with basically scientific Tower of Babel reaching up to geostationary orbit. The problem is that it is hard to build. Fraser: What is geostationary orbit? Pamela: The only problem is trying to build something that like is 36,000 kilometers tall is a bit difficult. Things tend to flatten like pancakes when you attempt to do that. Fraser:	We haven’t even built a building a building on Earth that is one kilometer. Pamela:	[Laughter] Right, right. Currently we don’t have any materials that we can build up and the materials won’t fall apart underneath their own compression. Fraser:	In theoretically though, if you went out and built a Sears Tower or a CN tower and got all the way up to 36,000 kilometers, then, if you could stand on the top of that tower you could just jump and drift away from the Earth. Pamela: Exactly. Or at least drift into a different orbit around the Earth. You’d hover there. Fraser:	You would drift into a sort of widening orbit around the Earth, right? Ever widening the harder you push. The point is it is easy to get away from the Earth at that point. Pamela:	Exactly. Having realized that building up is not so good, different people look for different strategies and maybe reversing the idea. The next logical idea was to put something in space and drop a cable down. This is where the original idea of a space elevator came in where the top of the elevator is one way of envisioning it was as an orbiting castle. This was another Russian idea where you basically have a giant castle attached a tether here on the surface of the Earth. The idea of a castle or an asteroid or some giant something is you want the center of mass of your entire cable to be the geostationary point. That way, you end up with a giant long-armed object that naturally keeps itself constantly in pace with the place on the Earth that it is orbiting over. You have long tether that reaches all the way down to the surface of the planet. The longer you make it, the more it weighs. Some estimates have this coming in at 18,000 tons. That’s a lot. Then as you build up, you need to balance all of that mass. You stick either more cable past geostationary orbit, or you just build a giant space station, you tether a rock there. You need something to balance out all of that mass. Fraser:	Right, some kind of counter balance. You would, depending on what the number of actual weight of the cable is, you would take that cable, and you would drop it down from some geostationary orbit down to Earth. Then you would need to counter balance that weight by the rock or extend something the other way. Kind of like a teeter-totter, right? Fraser:	The geostationary orbit is the middle point of the teeter-totter, and then the one side of the teeter-totter is down to the Earth. The other side of the teeter-totter is out into space to balance out the weight. You could put a heavier weight on the far side of the teeter-totter, but on the close side you’re going to need cable getting down to the Earth. Fraser:	Okay. That sounds about as easy as building a tower 36,000 kilometers tall. Pamela:	[Laughter] The problem is we don’t currently have anything that is strong enough to deal with this. Let’s imagine that we can use the lightest weight per amount of strength thing that we know of, and that is carbon nanotubes. With carbon nanotubes you start to be able to imagine making a single ribbon that just very carefully, not really capable of carrying anything, but a single ribbon that spans from the surface of the Earth all the way up to geostationary orbit. That ribbon, not really capable of carrying anything, is going to weigh 18,000 kilograms. It’s still not strong enough, we think. We are still working on figuring out how to build things out of carbon nanotubes, this is completely new technology. Fraser: Yeah. From what I understand, people haven’t gotten carbon nanotubes lined up longer than a few centimeters, right? Pamela:	Right. And we’re looking at needing to have something that is about 200 times stronger than steel to make this successful. You can, we think, do that with carbon nanotubes. This is where we start getting into really strong, stronger than diamond, materials are needed. Fraser: Right and I know that one of the ideas is that you make it thicker towards the middle point and you thin it out as you go. The end that is actually hitting the Earth is quite small. The point being that the part of it that is right next to the midpoint has to be holding up everything below it. As you get closer and closer to the Earth, it doesn’t have to be as strong, right? Pamela:	Right. The other thing that you also unfortunately have to deal with is, this cable is getting used to basically yank, not just up, but also in a horizontal velocity whatever sort of elevator car you have going up and down. The car, when it starts off at the surface of the Earth isn’t moving as fast in the direction parallel to the surface of the Earth as that counterweight way above the surface of the Earth is moving. As it goes up it has to complete every 24 hours a bigger and bigger and bigger circle. To gain that velocity the cable has to be able to yank it along. If you’ve ever tried to yank something even at a few tens of feet per second, it requires a lot of force. In fact, it is a really good way to break a rope. We’re looking at having to get something going many, many hundreds of kilometers per hour and you need to have all of the strength to yank it sideways and carry all of the mass at the same time. Fraser:	Let’s say that you could overcome the structural issue and you could overcome this horizontal movement. 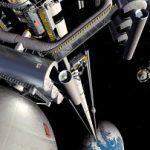 What would sort of the space elevator then kind of look like, and how would it function? Pamela:	There are basically two different models. In both cases you need to connect it to someplace exactly on the equator of the Earth. That way whatever your counterweight is it stays exactly over it. One of the things we don’t think about very much is, you can have something that is constantly over the same north/south line on the planet of the Earth that goes around the planet every 24 hours, but as it does it goes up and down, up and down that north/south line. To get something to stay exactly over the exactly same point of the Earth, you can only do that over the equator. Somewhere along the equator you drop the cable down. There are two different ways of doing it. You either drop it down to the top of the mountain and this is a reasonable idea because it allows you to not have to build as much cable. There are mountains out there that are kilometers tall. You just build on top of one of these mountains and save yourself the extra weight and the extra trouble. The problem is there is junk in space. If you’re attached to a solid point on the planet Earth and you don’t really get more solid than the top of a non-volcanic mountain, you can’t move your platform and orbit around it all to get away from space junk. The other idea is let’s instead attach it to someplace out in the ocean. Let’s attach it to a mobile platform of some sort. While this allows you to avoid space junk, it gives you added problems of how do you get power to it? You’re adding now I have to go across the ocean and then go up. That just adds stress. Then you have the added weight of having to get all the way down to sea level instead of just getting to the top of the mountain. Fraser: You would have some kind of ground structure, be it on a mountain or be it on the ocean, where the cable is actually affixed to it? Fraser: Say you had some cargo you wanted to take into orbit, you would drive to it or take your boat to it, and then you would put it onto some kind of an elevator, right? Some kind of climber? Pamela:	That’s exactly what they call it. Some sort of a climber. These are somehow symmetric about the cable to make it a little bit easy. You still want to keep it as lightweight as possible because the heavier the object you’re lifting, the more energy is needed. You still have to compensate for having one gravitational potential energy when I’m standing on the surface of the planet and I have a completely different gravitational potential energy when I am high off the surface. You have to give all of that energy via work whatever it is you’re lifting. You have to increase its velocity so that is increasing kinetic energy. You have to add all this extra energy into whatever it is you’re lifting. It’s easier if you do it a small load at a time. You take your hopefully fairly lightweight whatever it is and load it onto the cable and start heading it up. As it goes up, one of the cool things is conservation of angular momentum actually says that the rotation of the Earth is slowed down minutely as the one object goes up. When it comes back down the rotation of the Earth is then put back to where it was if the same amount of mass comes back down. But it is still kind of neat to think about that if we slowly but surely sent enough mass into outer space we could slow the rotation of the Earth noticeably. Fraser: How long would the journey take then? I guess it depends on the speed of the climber, right? Pamela:	It depends on the speed of the climber. I haven’t seen anything on that but you’re traveling 40,000 miles. Well, 36,000 basically. You’re going a long ways. It’s going to take a long time. Pamela:	Right. But we’re looking at a few hundred dollars to get up there instead of per kilogram and spend thousands or tens of thousands of dollars per kilograms. The cost savings is great. Unfortunately, we don’t have the materials to do it yet. Fraser: Although I am sure we’re going to get a bunch of angry e-mails from people who claim otherwise. I think there are a lot of people who differ on whether we can do it or not. We look forward to your e-mails. Pamela:	[Laughter] There are a lot of people working towards the many different prizes around the planet that. The X PRIZE is set up to encourage cheap vehicles that are capable of going up multiple times in short periods of times. That was what was won by Spaceship One a few years ago. There is an X PRIZE to get to the moon. There are all sorts of really cool X PRIZEs around. Fraser:	There is an X PRIZE just for who can make a climber that can climb up a ribbon the fastest using solar power and even beamed laser power from the ground. Pamela:	That’s how they are looking to be able to fuel these things. The lasers are looking like one of the best options for getting energy onto one of the climbers. There are people working very hard to try and overcome the how we build a strong enough, long enough cable. What is really cool is there is a company here in America, Liftport, that their eventual goal is to be constructing these carbon nanotube fibers basically to build us all the way into space one string at a time. While they work on developing the technologies necessary to do that, they are building all sorts of other products that are funding their research. It’s cool to see that there are people thinking about how to do this, and thinking about how to do this in a commercially viable way. Japan is sinking lots and lots of effort into this. Many countries are thinking about how to do it. There are some companies working very hard in that direction. We’re still figuring out carbon nanotube fibers. It’s a brand new technology and progress is being made. Hopefully in the next few years this will go from we don’t know quite know how to do this to yeah, this is easy. Let’s go build one. Fraser: Now there are a bunch of risks to this situation. Obviously, what happens if the cable breaks? Pamela:	That’s a very bad, bad, thing. Fraser: You’ve got a cable that is longer than the diameter of the Earth, right? Pamela:	It’s actually very close depending on how they build it. If you use the giant floating castle as your counter balance, then you have less length coming down toward the surface of the Earth. Fraser:	You’re talking 36,000 kilometers. The diameter of the Earth is about 40,000 kilometers. Pamela:	Some of the cables they are looking at are 100,000 kilometers long because they are planning to counter balance the cable with more cable. In which case, you now have a giant cable falling toward the Earth for who knows what reason, capable of wrapping itself twice around the planet along the way creating tidal waves. Creating new valleys where valleys didn’t use to be. Shredding cities in fascinating ways. Pamela:	Kim Stanley Robinson talks about this in detail in his Red Mars series, where he goes from building the space elevator, to space elevator tragically gone wrong due to terrorism. That’s a feature that I have to admit scares me a great deal. While I love the concept of space elevators, I’m a fan of space elevators with really large military safety precautions. Fraser: think one of the issues is where it breaks. If you have actual tension in the elevator that it wants to pull away from the Earth, then wherever it breaks the part that is above the break is just going to drift away from the Earth. Pamela:	A micro-meteor hits it and severs it in the wrong place. That’s where you really have to start being afraid. What if the sucker gets knocked by an asteroid in just the wrong way? Fraser:	I think for a lot of the other, as you said, terrorism is the same thing, right? If you go up to one kilometer and you try to chop the cable or even explode it from the ground, the cable is just going to drift away, right? Pamela:	Yeah. It’s when you get control of that counterweight and you move the counterweight. Fraser:	Yeah, these are gigantic engineering issues and could have some gigantic risks. I think that a space elevator is the most feasible way to get enormous amounts of mass off of the planet and out into space. Pamela:	At the end of the day you still have to wonder is it more feasible perhaps to go out and grab an asteroid and instead of taking mass from the planet Earth and putting it into space, to start mining space itself and move the construction workers into space. These are the debates we’re going to have. Fraser:	But even people, right? Large amounts of people. I could almost afford at $100 a pound, if I really save my money. Pamela:	[Laughter] Sell your house. Fraser:	Sell my house. I’m never going to be able to afford $10,000 a pound to leave the Earth, right? Pamela:	Right. The going rate is $3 million with the Russians. A few hundred thousand if you get your seats now for Spaceship 2. Fraser: Yeah, exactly. Now what about space elevators in other places? I know the Earth is very high gravity, but there are some other places we can put them. Pamela: Right this is where Kim Stanley Robinson’s idea of attaching one to Mars was such a straight-forward idea. It’s a lower gravity system. Grab yourself a moon, start mining it and dropping down toward the surface. In these lower gravity areas you don’t need to have as thick of cable. Suddenly it becomes much easier to weave together enough carbon nanotube fibers. Fraser:	Or spectra or some regularly available stuff. Pamela: You also don’t need as much energy to get from the surface of the planet to a geostationary orbit when your geo belongs to Mars instead of the planet Earth. Fraser:	One of the big, big issues with Mars we’ve talked about this a bit in the past, landing heavy payloads on the surface of Mars. This is going to be really dangerous, and really scary to do it. If we’re going to be serious about colonizing Mars, then maybe that makes a lot of sense, right? Build a space elevator there at a fraction of the cost that it would be here on Earth, lower things down. Pamela:	One of the ideas that came forward in Kim Stanley Robinson’s book, which apparently I am just going to keep plugging. I love the book. Fraser:	Yeah if you haven’t read Kim Stanley Robinson’s books. Which one, he did the three Mars books, are you talking about something different? Pamela:	No. This is again all the Red Mars series. But all his books are good. Fraser:	Yeah, Red Mars, Blue Mars, Green Mars. Pamela:	The idea he had was let’s use the space elevator to get colonists from space down to the surface. Then use space elevators to get mine substances, to get basically goods from the surface of Mars back out to orbit. You have this exchange of mass going on. Fraser: Another really good place for a space elevator is the Moon. Pamela:	There you actually start looking at why we don’t start thinking about sky hooks which isn’t something we haven’t really talked about. Instead of having a nice friendly hanging non-moving elevator, the sky hook idea is you put something in lower orbit and you set it spinning. You essentially fling yourself into higher and higher orbits on this set of interconnecting hooks. You get caught off of an airplane, spun into a higher orbit. You get caught by different hook in a different orbit that just happened to line up at the right moment. You get almost a set of interlocking orbiting gears that go in and out of phase with one another and allow you to fling yourself into deep space. Fraser:	I actually did an article a few years ago about an elevator on the moon, same idea. You put an elevator on the moon facing directly towards the Earth. What you can do is put a counterbalance in, there is a Lagrange point in between the Earth and the moon. You could put your counter balance in there and it would be almost like you’re floating something off of the bottom of the ocean. That it floats up and pulled the cable tight because of the way it would sit in the Lagrange point. That, as you said, there are lots of ways we could get the resources from space, and then there are a lot of options then. Pamela:	What is crazy is we’re essentially imagining a future where we’re weaving our own space highways where Buck Rogers and the 21st Century rocket ship is getting replaced with little spiders climbing between all the different special locomotion places. They’re climbing between the Lagrange points, between the geostationary obits. Then we have little shuttles that get you between these places. Other than that, you’re stuck on the ribbons. Fraser:	Yeah, yeah. But it allows you to make these changes from gravity walls at theoretically the lowest possible cost. That would be a true space faring solar system civilization. Pamela:	[Laughter] and it always comes down to the economics. Fraser:	Economics. But, hopefully, if the prices come down and if there’s money to be made then boy, sky’s the limit. I’m sure we’re going to get an e-mail from the Liftport folks telling us how far along their progression is and we’d love to hear from you. Pamela:	And we are supporting what you do. Pamela:	This year it’s not getting built. Fraser:	No, we are absolutely enthusiastic about the concept of space elevators. They are not as crazy. I think that’s the thing is that they are not as crazy as you might think. Fraser:	Build a cable from Earth to geosynchronous orbit. That’s insane. But, when you actually sit down and you do the math and you do the costs it’s not outlandish. There are mega projects that get built on Earth that would cost more money. Pamela:	I just want a giant security system. Fraser:	Sure, sure. I don’t. Let’s just make it happen. Do any of the Astronomycasters have any sense of how crazy this idea really is? Is it any less-crazy than a Space Elevator? Are the energy requirements a deal-breaker? And then there’s the skyhook () as well. The advantage of a skyhook is that it doesn’t need to reach all the way down to the surface of the Earth, so could in theory be moved around as needed, and would probably be cheaper to build and lighter (therefore safer). The disadvantage is that it doesn’t reach all the way to the surface of the Earth, so you’d need to hop on a plane to “dock” with the lower end of the skyhook and catch some sort of transfer vehicle at the top end. Also it wouldn’t have as much inertial mass so it’d be harder to keep it in one location. Faser keeps saying Earth’s diameter is 40 000km. It’s Earth’s circumference that’s 40 000km. Also, a cable break wouldn’t necessarily damage the earth: most of the cable would burn up when entering the atmosphere. Thats really scary to think about. The cable being long enough that if it breaks it could wrap around earth causing heaps of destruction. O.o I don’t think it would burn up in the atmosphere because weren’t they going to make the cable out of some really crazy material, like carbon something i don’t know. Maybe I missed something — wouldn’t it take as much energy to lift an object along the cable as it does to push the object with rocket engines? Is the advantage of the elevator just that we don’t need to use rockets? What energy source could be used to lift the objects? Mitch, they are looking at nuclear and solar power for it. This is partly what the climber xprize is for. The danger of a cable breaking is not it falling on the Earth, as it is extremely light, and it is unlikely to break close to GSO, but someplace in the first 1,000 km or so. What is dangerous is that the counterbalance is likely to be moving at almost 100,000 km/hr, which will, lacking major countermeasures, yank the rest of the tether up through GSO along a very long arc, potentially damaging hundreds of billions of dollars of other satellites that are and will be in GSO. And, I would say that it is almost certain that any elevator will break at some point, because even theoretically, the load is close to the limit of materials. Every object, from the smallest to the largest, orbiting below GSO is likely to cross the path of a space elevator at some point in their orbital life, and many of them will be smaller than we can currently detect. We cannot even find all NEO’s larger than 1 km in size, so it seems unlikely that we will be able to even know about, much less track, all the tiny particles that could cut a space elevator with the greatest of ease. And Mitch, even if it were to take the same amount of energy(which it does not), it does not require rocket fuel or major fairing, nor does it require that the energy be expended in a matter of minutes. Most elevator writeups say that it is unlikely that the elevator will move at more than 200 km/hr and will require somewhere upwards of 200 hours to climb the elevator. With power that is not onboard the climber, you don’t have to lift the body of a rocket anywhere, only the load and the weight of the climber. And, by the time you reach the altitude of one radius, gravity will be approximately one fourth Earth normal, and at GSO, it will be less than one part in twenty-five of Earth normal. The major issue is the horizontal force on the station at GSO and on the counterbalance out further. That must be compensated. There’s an interesting Wikipedia entry on Tether Propulsion which covers the use of flexible tethers. Dr Robert L Forward set up a company called Tethers Unlimited Inc to develop some of these ideas. Arthur C Clarke explored some of the problems of a Space Elevator in “The Fountains of Paradise”. Another related concept is the Space Fountain – again, try the Wiki entry.